You know you're supposed to have a website, post on Facebook once a day, post a photo of a cute dog on your Instagram, and send mail to your top customers. As you work through the list of marketing tasks on your to-do list, it's easy to think: how much of this is actually being seen by the right people? These days, pet specialty retailers are having to compete with consumers being overloaded with marketing messages, having more channels to keep up with than time to manage them, and competing against the efficiency of shopping online. It's no wonder that we're so tired at the end of the day! So, how are you supposed to stay top of mind while still keeping your mind in tact? Recall the last time you were at a party, social gathering, or even a restaurant at peak time. What were the conversations you had like? Did you feel like you were yelling and not being heard, even though you were just inches away from the person you were trying to talk to? Now, imagine the Internet is this room. Everyone has something to say and they're all trying to get their audience to pay attention. These days, we're all being bombarded with marketing messages. Businesses from nearly every industry are fighting to tell us what they have to say, to capture our attention for even just 10 seconds. We're so overwhelmed with messaging that many of us have learned to block it out. In fact, studies have shown that "the average consumer is exposed to up to 10,000 brand messages a day." How many of those 10,000 do you remember on a good day? One? Two? Maybe three? Use your brand's story to create your unique voice and promote something people can relate to and connect with. Consider: Why are you in this industry? What are you trying to accomplish with your pet business? How have you pulled this off? How have you affected the lives of your customers? Narrow down your audience to a very specific niche. Consider: Who isn't being marketed to as much? Who has the questions you can answer? For example, maybe you're located near a university - consider marketing to college students who have pets in the fall after school has started. Facebook, Twitter, Instagram, Pinterest, LinkedIn, Vero, Medium, Snapchat; the list goes on, and those are just the social media platforms. Every day, it seems that the next best platform is coming out and, with it, thousands of articles talking about how that one is the one that you must be on. But what about all the others you're already on? Whether you're a one-man operation running a pet store and managing the marketing efforts for your business or part of a marketing team for a regional chain, there are just not enough hours in the day to manage a presence on every possible platform. If you try, you're going to find yourself burned out, unsuccessful, and ultimately just adding to the noise. Instead of being everywhere at once, focus on one or two specific niche audiences related to your business goal. Where do they spend most of their time? Where are they truly engaging and interacting with brands? The best way to find out is to ask for yourself. Going back to the university example, consider talking to college students in your store. Find a few example customers and do your research to find out where they're hanging out online. Once you've done this, consider the difficulty of creating and maintaining a presence on each platform, as well. For example, Facebook recently changed their algorithms (again) so that Facebook pages have a much harder time getting in front of their followers organically (or without paying). However, it's still possible to grow naturally on Instagram without paying too much (yet). Raise your hand if you've ever found yourself lying in bed at night, thinking about the day that passed, and felt a sudden jolt: you forgot to pick up the dog food. Crap. Oh wait, it's no big deal. You roll over, pick up your phone, and five taps later you've got a bag arriving in just two days. Perfect. Every day, we're competing against our available time, energy, and resources to be as efficient as possible. We take the shortest route home from work so we can arrive five minutes early. We ask for book recommendations so we don't have to sift through hundreds of reviews online. One of the biggest benefits e-commerce offers is efficiency. Even if they have to wait two days (the expected delivery time these days) to receive their order, many consumers would rather order most of their necessities online than drive to the local store. How can you, as a brick & mortar retailer, compete with that? First of all, it's worth noting that not everyone prefers shopping online. There are still a fair share of consumers who enjoy the physical experience of shopping in person. However, those numbers are slowly dwindling as efficiency and cheaper prices become king. Of course, there are plenty of other solutions that could work. It all comes down to discovering the right audience and using your unique brand story to stand out from the crowd. 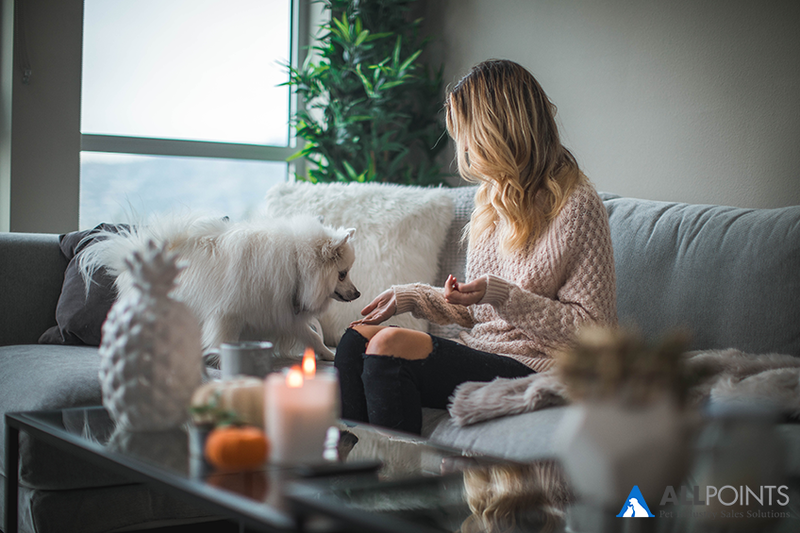 What challenges are you experiencing marketing to pet owners in 2018?